The 1999 Xenomorph classic is now back in the multiplayer game, thanks to a new patch from developer Rebellion. The version of Alien vs. Predator released earlier this month was pretty special, including all the content from 2000s Gold edition, as well as bonus content from the Millennium add-on pack. One thing it lacked however, was multiplayer; but as of yesterday, multiplayer was reinstated following a patch from Rebellion Developments. The multiplayer patch will allow players to search for and join matches their friends are playing in. However, dedicated server functionality is not included in this patch, and is not planned for any future patches either. 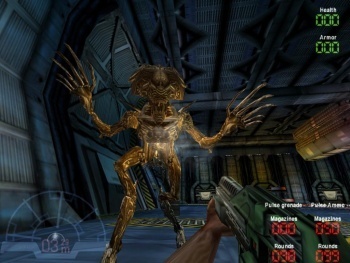 Revisiting the Gold Edition is a great way to get ready for the new AvP game, which will be released in just a few weeks; or a great introduction to the franchise for those who missed it the first time. Alien vs. Predator Classic Gold can be picked up on Steam for about five bucks.